For years, West Linn resident Dean Suhr has organized the "Honoring Those Who Serve" event on Sept. 11 to make sure no one forgets what happened on that tragic morning in 2001. Educating younger residents about the event — and the sacrifices made by first responders and the U.S. military in its aftermath — was of particular importance to Suhr. But with each passing year, that task becomes a bit more challenging — especially since some of the city's youngest residents weren't even born yet in 2001. "The problem with youth today is they don't have anything to forget," Suhr says. "We have to teach them." 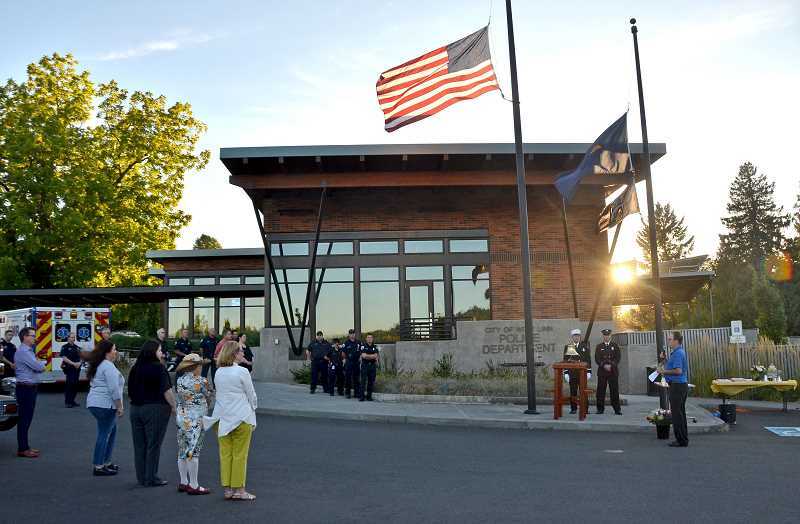 People of all ages will have a chance to remember and learn at this year's Honoring Those Who Serve event, which will take place at 6 p.m. Sept. 11 at the new Tualatin Valley Fire & Rescue Rosemont Station 55. As in prior years, Suhr will also lead the "Yellow Ribbon Project" on West A Street — distributing ribbons to be tied to the bridge overlooking Interstate 205. The ribbon project began Monday, Sept. 3, and will continue through Sept. 11. "We invite the community to stop by (hopefully with their families) any time prior to 9/11 to pause, remember and add their own ribbons to the display," Suhr says. The main event will be similar to years past, with the goal of honoring victims of 9/11 and the war on terror, while also recognizing local first responders. "We kind of take them for granted until we need them," Suhr says. "It's an opportunity to honor them outside of any emergency event. ... They don't like to be called heroes, but they really are heroes." The event will feature a symbolic bell ringing as well as a blessing from the Emmanuel Presbyterian Church pastor. "There will probably be words from a local politician or two," Suhr says. "And this year, we'll be building four bouquets — one for each fire hall and the police department. The public are urged to bring their own flowers." TVFR will also show off the new tiller truck housed at Station 55. "They are going to take out that ladder truck, pull it out in the driveway and raise the flag on it," Suhr says. "So that will be something new and exciting for the kids to see." If the truck proves to be a draw for local kids, Suhr hopes the event will also provide education for those who were not yet born on Sept. 11, 2001. "As I've been with different groups of kids over the years, you could see early on that the kids were old enough to remember the event and their parents' reaction," Suhr says. "As years have gone by, they only see it on TV — and now it's on TV less and less. It's been really interesting to see what their perspective is on it. Do they know it as 'more TSA security' or as a day of service?"